•A survey log or running table of survey questionnaires that are recorded. •A Survey Form, which is designed to generate a Survey Questionnaire that can be sent to a customer and capture the results returned by the customer. •The Survey Questionnaire is designed for 10 rating type questions that are answered on a scale of 1 to 10. Therefore the highest possible score is 100. •The 10 X 10 Survey can be easily modified or customized for a variety of surveys, including options for a 5 question and scale of 1 to 10 rating. 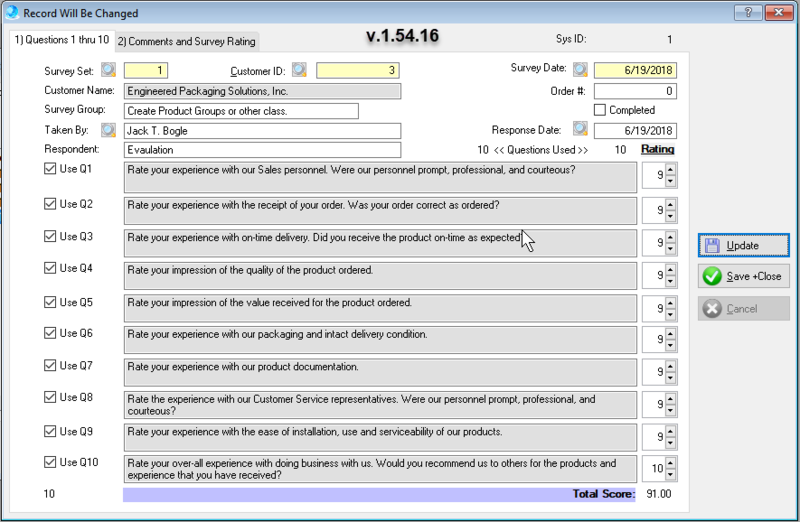 •Survey Sets are a collection of Survey questions and our elements of customer satisfaction. The select a Survey Set through the lookup table will populate the question fields in the Survey Form window. •The [ Customer Id field ] is a reference to your customer and is linked to Customer lookup table. •Survey Groups may be used to designate regions, products and other user defined purposes. •The þ Completed checkbox may be used to signify that the response from the customer has been recorded and completed. •The numerical spin field limits the rating response to be between 1 and 10. •The Comments Tab may be used to record customer comments.